Spellcrow is a third party designer that creates "count-as" troops and units with different designs than the normal forces featured in Games Workshop. Personally I love their Plague Legion stuff and already have their Plague Lord, so I decided I would expand my force and add in this Havoc Squad Featuring 2 Heavy Bolters and 2 Missile Launcher. it is a rather uncouth Plague Marine armament for those used to 1-3rd ed Warhammer 40k. 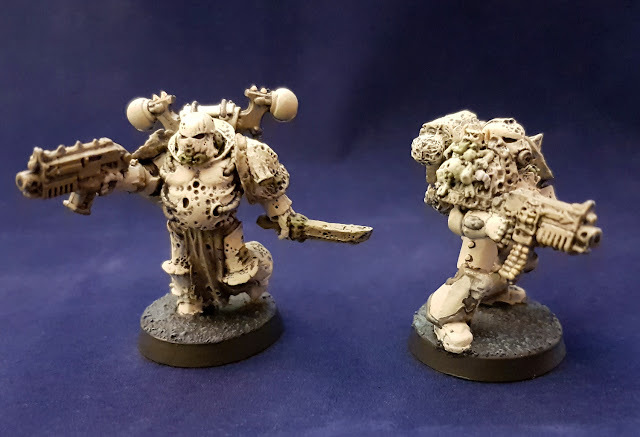 The Spellcrow bits feature, arms, legs, heads , shoulders, backpacks and even weapons all done in the diseased and decaying style of nurgle. This squad is comprised of bits from standard Space Marines, Chaos Space Marines, the Old 3rd ed to 7th ed Palgue Marines and heads, arms and torso from Spellcrow. 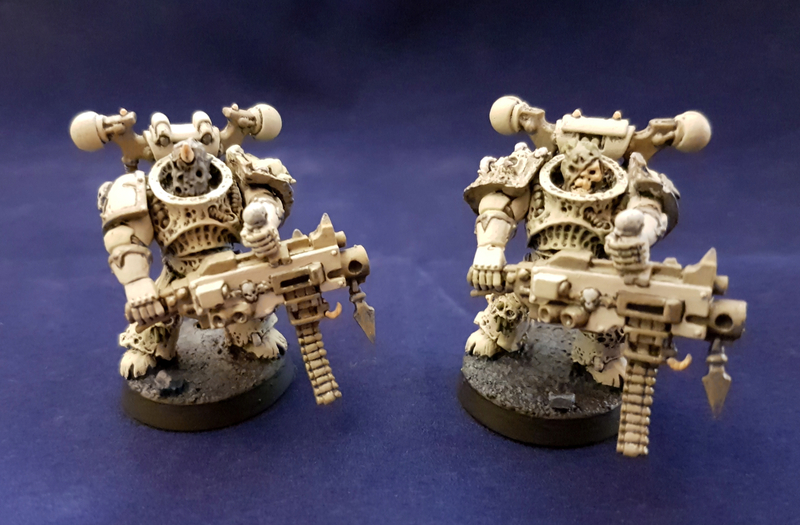 Some of the minis are re-paints of old minis I made in my teens. 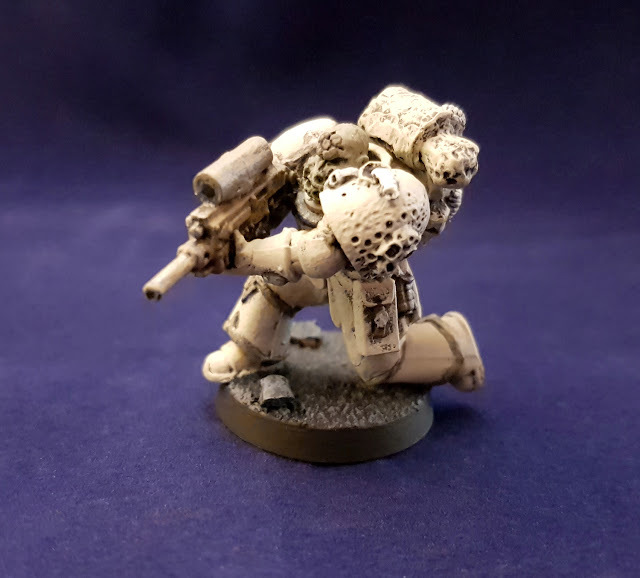 This custom kneeling figure with a extended barrel and scoped boltgun only needed a new shoulder pad, backpack and head to make it work with my current force. 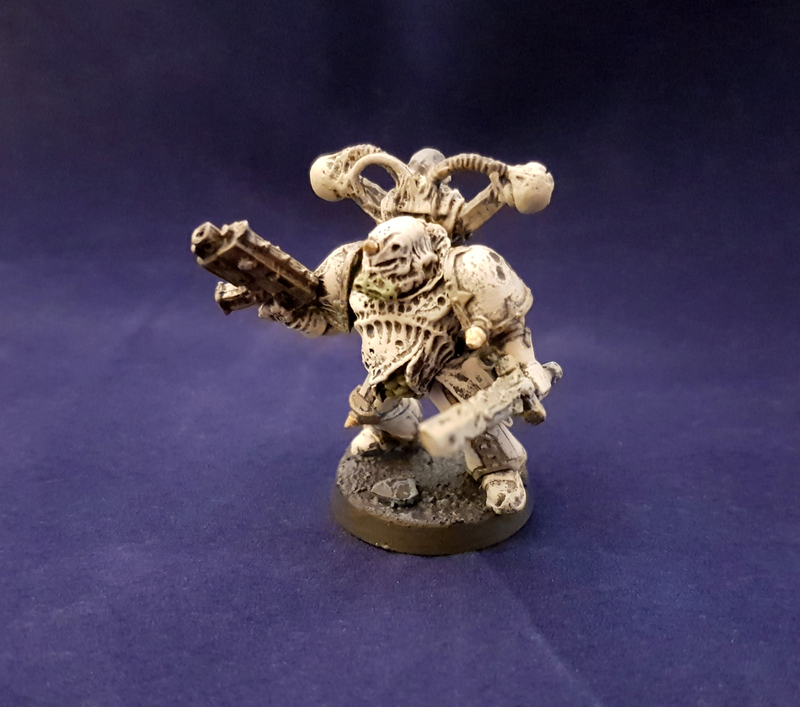 I am quite proud of this guy given that I made him 13 years ago, just took this long for my painting to catch up. This standard comes from a Plague Bearer's box, and just happened to be a spare standard I had lying around. I really like the idea of standards and try to include as many as possible. 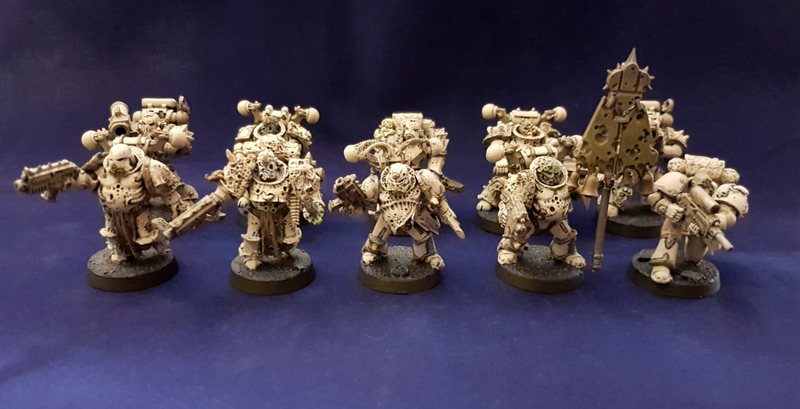 Oddly and I swear without planning it, my Plague marine army has 7 Banners: the holy number of Grandfather Nurgle. 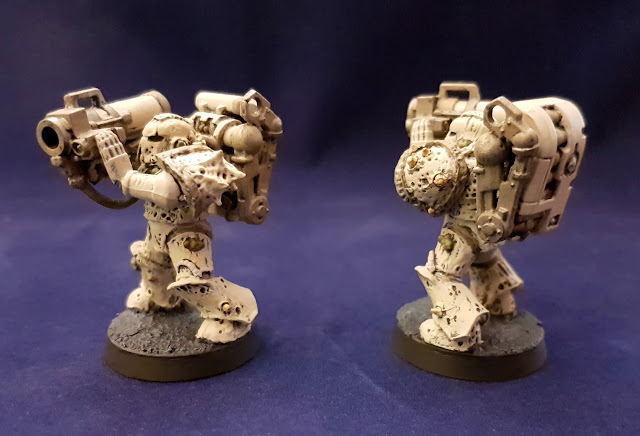 As great as the Spellcrow Plague legion bits are, it is important to note that they are slightly larger then you average Space Marines, and while the conversions do work, often the components will look over-sized. Meaning it is frankly best to build your squad using only Spellcrow parts and the downside there is that it is farily expensive. 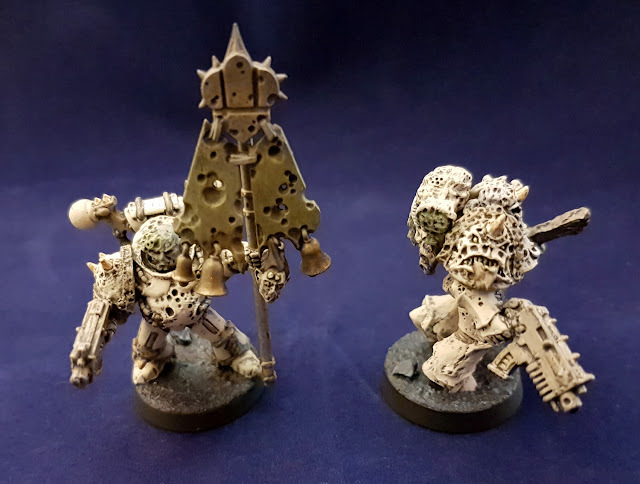 I started playing Warhammer when 3rd edition was just coming to a close, and back then any unit with a Mark of Nurgle was forbidden from using Heavy Bolters, Missile Launchers, Auto Cannons etc. Your heavy weapons choices were limited to Plasma Guns, Melta Guns, and Flamers if you wanted to run a Havoc Squad. Those restrictions were lifted in 4th edition, and I can now make use of one of my favorite suppression weapons in the game. The final pair of heavy weapons I added in were indeed missile launchers, which is to give them a strong and long ranged punch. At the time of writing it has been a while since I last played, as me and my sister are trying to get her army into a usable state, and we both have full time jobs; so it takes a while! But I am sure they will dominant the field, especially if I mount them in a Rhino as I plan to.